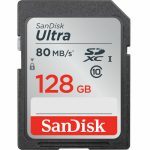 Categories: CF Cards, Memory & Batteries. The 32GB Extreme Pro UHS-I SDHC U3 Memory Card provides photographers and videographers with a high-speed SDHC memory card rated Ultra High Speed Class 3 (U3) and SDHC Class 10, offering up to 95 MB/s read and 90 MB/s write speeds. 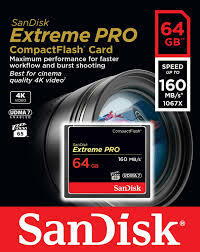 This high-capacity card is specifically engineered for sustained RAW + JPEG burst shooting modes and fast-action Full HD video recording. 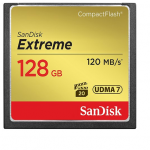 The SanDisk 128 GB Extreme CompactFlash Memory Card provides fast, reliable photo and video capture. 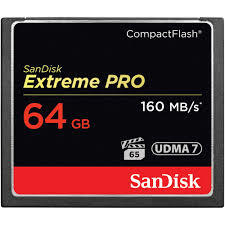 This card features a read speed of up to 120 MB/s and a write speed of up to 60 MB/s. Ultra Direct Memory Access 7 (UDMA-7) ensures optimal performance. 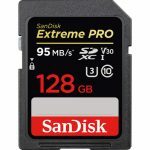 When paired with a UDMA-compliant DSLR camera, this card guarantees fast, high-quality photo and video capture. Enjoy the security of a limited lifetime warranty.